Image © DC Comics. Written by Dan Jurgens, art by Mike Perkins, colors by Hi-Fi, letters by Dave Sharpe. 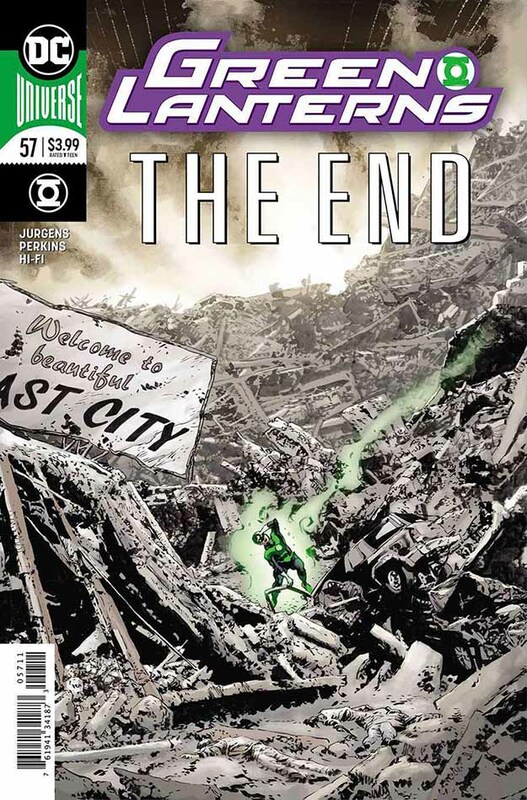 Not only the end of the “Evil’s Might” story arc, this is the end of this GL series, though as I write this I’ve already reviewed the first issue of the next one and admired it greatly. Hank Henshaw has been stymied in his attempt to completely control the entire Green Lantern Corps as well as the Guardians through infiltrating their power rings and central battery. Just enough of the group have avoided his contamination to keep him from achieving that control. In a rage, he’s off to Earth to destroy Coast City, as he did once before. Hal Jordan is determined that should not happen. I will leave it to you to decide which way that’s likely to go. In all, I’ve enjoyed this arc, both the writing of Dan Jurgens and the art of Mike Perkins, not to mention the continuing excellence of Hi-Fi and Dave Sharpe, who have been on board for a long time. Much the best to go out on a high (if somewhat predictable) note, and there are a few surprises at the end of this issue. This entry was posted in Comics, Reviews on December 3, 2018 by Todd.